SAN ANTONIO, January 30, 2017 – America’s Small Business Development Centers (ASBDC) across the country create a new job every five minutes, a new business every 31 minutes, generate $100,000 in new sales every seven minutes, and generate $100,000 in capital every 11 minutes. 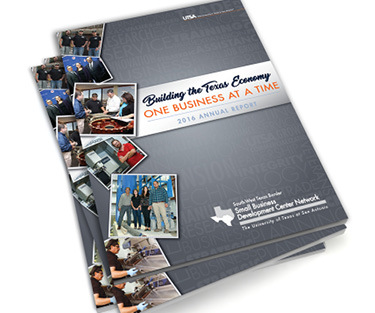 As a major network within the ASBDC, the South-West Texas Border SBDC Network (SWTXB SBDC) kicks off the year with the release of its 2016 Annual Report, reflecting huge economic impact for the State of Texas. The SWXTB SBDC Network is hosted by the Institute for Economic Development at the University of Texas at San Antonio. The SWTXB SBDC Network is comprised of 10 field centers across South, Central and West Texas. Stretching across 79 counties, the vast territory of the SWTXB SBDC Network encompasses 108,000 square miles including the Texas capitol. The Network keeps its mission aligned to support the State of Texas in job creation, international trade and investment, small business advocacy, entrepreneurial support, and business retention and expansion. SBDC clients in Texas continue to outperform the average Texas business in sales and employment. Those clients’ expanded growth margins generated more than $62 million in additional state tax revenues for Texas. “The South-West Texas Border SBDC Network and its affiliate SBDC host institutions extend great thanks to our business and community clients, economic development allies and team members for the diligent work and service that helps grow the Texas economy,” said Albert Salgado, SWTXB SBDC Network Director.